When to Buy a Futures Option Strangle? The profit potential is unlimited in either direction. What is the Risk of a Long Option Strangle? 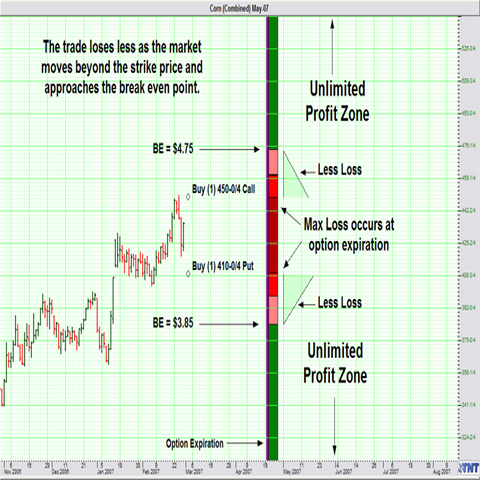 Maximum loss is realized if at expiration the market is trading between the strike price of the put and the call. A futures options trader that strangles the market is indifferent to the direction, but is anticipating a large move and a corresponding increase in volatility. The idea of making money whether the market goes up or down is desirable for many beginning traders. In their mind there is a fifty/fifty chance of the market going either up or down. If you have both a call and a put, how could you lose? Well, there is a reason why people don’t simply buy commodity option strangles and wait for the market to go either up or down. It is not that easy. The odds are stacked grossly against the position. While it is true that the trade is directionless and has the potential to make money regardless of the path that the market takes, it is highly unlikely that the market will move enough to cover the original cost of the trade. In order for a commodity strangle to be profitable at option expiration, the underlying futures market would have to move enough to overcome the premium paid for both the put and the call (don’t forget about commissions) in the time period allotted. A market’s tendency to stay range-bound makes a move of this magnitude difficult to attain. The chart below visualizes the type of move necessary to return a profit to a strangle buyer. To determine the break even points of a long option strangle you simply take the strike prices and add or subtract the total premium paid. If the market rallies your break even on the strangle will be the strike price of the call option plus the premium paid for both the call and the put options. If the market is heading lower, the break even is the strike price of the long put minus the premium paid for both the long call and the long put. Long strangles require a substantial market move just to break even. This leaves the odds of success on this type of strategy to be less than desirable in most instances. A strangle holder will lose less for every tic the market makes beyond their strike price but before their breakeven point. Remember, in a long option strategy your maximum risk is what you pay for the options. 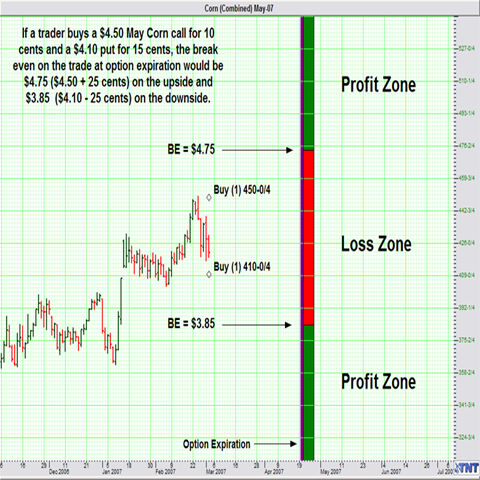 Using the example above, if the price of May Corn was at $4.00 at the time of expiration, the trader would be in a losing trade, but it wouldn’t be the maximum loss of 25 cents, or the amount of premium paid for both the call and the put. Instead, the trader would lose the amount of total premium paid minus the intrinsic value (how far in-the-money the option is). In this case it would be 15 cents, or $750 (25 cents paid – 10 cents intrinsic value = 15 cents x $50 = $750). In its simplest form, the trade results in the maximum loss unless the market is above or below the strike price of the long options. From that point, the trader loses less as the market approaches the breakeven point. Beyond the breakeven point, the trader is profitable.